August 13 2018, 10:00 a.m.
Rayyah has lived in Khan al-Ahmar all of her 47 years. She raised nine children there, and 24 grandchildren; one more is on the way. Her family and neighbors, members of a Bedouin community known as the Jahalin, found refuge on this scorched patch of rocks and dust in the 1950s, after they were expelled from the land they had inhabited for generations, in the Negev desert, following the establishment of the Israeli state. The land Khan al-Ahmar stands on was under Jordanian control when the Jahalin arrived. Today, this smatter of tin roofs and tarps sits on the side of a highway in the occupied West Bank, surrounded by a fast-growing ring of Israeli settlements, which — while illegal — have become de facto suburbs of Jerusalem. The village, which is home to less than 200 people and where the only building with walls is a school made of mud and old tires, has become the latest front line in a conflict over land that for decades has determined the fates of Palestinians like the Jahalin. Israel wants the village razed, its residents evicted, and their land annexed to its ever-expanding settlements. Khan al-Ahmar residents say they are not going anywhere and have been able to rally remarkable international support around their cause, delaying demolition through a yearslong legal battle that remains nonetheless stacked against them. While Khan al-Ahmar’s plight is hardly unique, what is exceptional about the embattled community — which is surrounded by the illegal settlements of Kfar Adumim, Ma’ale Adumim, Alon, and Nofei Prat — is its position as one of the last-standing obstacles in the way of a decadesold plan to establish a contiguous Jewish presence between the West Bank and Jerusalem. 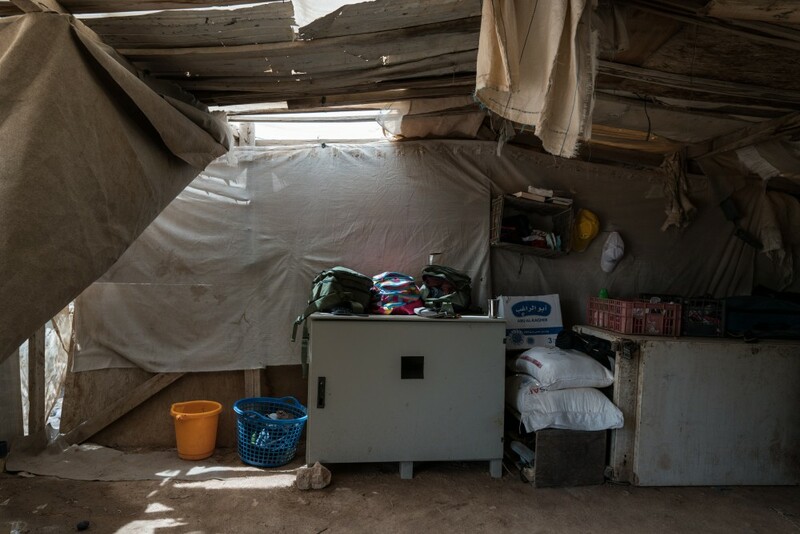 The interiors of homes in Khan al-Ahmar on July 26, 2018. On August 1, Israel’s Supreme Court confirmed an earlier ruling authorizing the village’s razing but temporarily delayed demolition, giving the Israeli government five days to come up with more suitable relocation plans than those it had previously offered — near a dump, and without any land the Bedouins could use to graze their animals.A day after the deadline, on August 7, the government proposed moving Khan al-Ahmar residents to temporary tents before relocating them again to a new site south of Jericho along with other Bedouin communities facing demolition — but only on the condition that they would leave Khan al-Ahmar voluntarily. Israel forcibly removed other Jahalin Bedouin communities in the late 1990s, and while violent evictions of individual Palestinian families have continued since then, Israeli officials have tried to steer clear of large forcible transfers — an ugly spectacle, as well as a war crime. In a statement, Tawfiq Jabareen, an attorney representing Khan al-Ahmar, rejected the proposal, which he said proved that “the plan of the state of Israel is to evacuate all Palestinian Bedouin and move them near Area A,” closer to areas under the Palestinian Authority, “in order to expand the Jewish settlements in places that will be emptied of Palestinians.” Khan al-Ahmar residents have made clear that they have no plans to leave their homes, making forcible eviction a likely outcome. 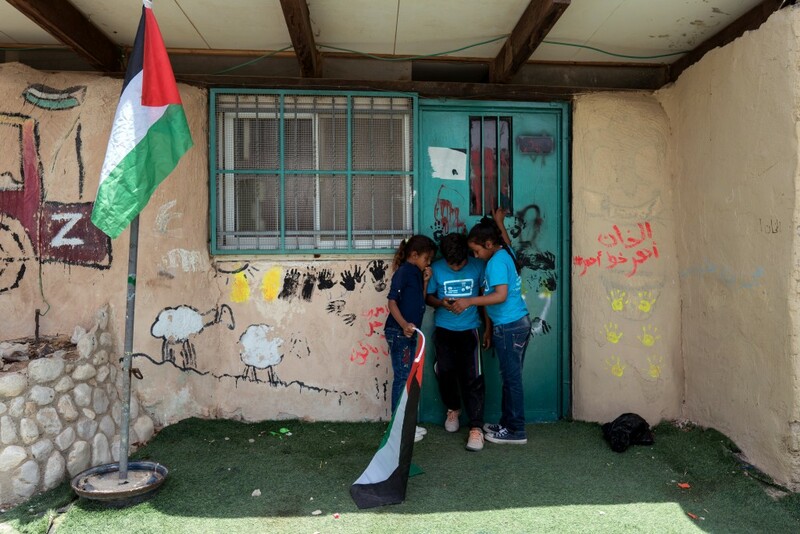 The outside of a Palestinian Bedouin house in Khan al-Ahmar on July 26, 2018. Israeli authorities routinely demolish homes built without permits — which are nearly impossible for Palestinians to obtain — and often use demolitions as collective punishment against the families of Palestinians who attempt attacks against Israelis. In July, Israel demolished a daycare and a women’s community center in Jabal al Baba, another Bedouin community outside Jerusalem, as well as several homes in the village of Abu Nawwar, near the illegal settlement of Ma’ale Adumim, leaving 64 people, mostly children, homeless. But Khan al-Ahmar sits in a uniquely strategic position close to what Israel refers to as “E1” — an area it intends to expand to create spatial continuity between the West Bank settlements and Jerusalem. So far, those plans have mostly stalled following international pressure, but advocates fear Khan-al Ahmar’s demolition will be the first step toward implementing that plan, which would further fragment Palestinian areas, isolating Palestinian-majority East Jerusalem and splitting the occupied West Bank in half. In the 1970s, when Israel expropriated the area surrounding Khan al-Ahmar, Uri Ariel, a founder of the Kfar Adumim settlement and today the country’s minister of agriculture and rural development, made no secret the move was part of a plan to establish “a Jewish corridor from the sea, through Jerusalem, to the Jordan river, which will put a wedge in the territorial continuity of Arab inhabitation between Judea and Samaria” — the names used by Israel to refer to the occupied West Bank. “This is a particularly strategic wedge because it’s in the narrowest part of the West Bank, and because it will complete the process of isolating East Jerusalem from the rest of the West Bank,” said Amit Gilutz, a spokesperson for the Israeli human rights group B’Tselem, pointing to Khan al-Ahmar on a map dissected by an intricate pattern of current and planned separation barriers and settlements, and Palestinian areas under various forms of Israeli control. Israeli workers place container houses near the town of Al-Eizariyah in the occupied West Bank on July 9, 2018, to absorb residents of the Palestinian Bedouin village of Khan al-Ahmar, who are set to be evicted. The plan to force the Bedouins out so the settlements can expand is hardly a secret: In May, days after a court largely made up of settlers upheld demolition orders against Khan al-Ahmar, the Israeli government approved the construction of a new neighborhood in Kfar Adumim, “reaching 500 meters from my home,” Abu Khamis told The Intercept.Israel argues that Khan al-Ahmar’s school and homes are illegal because they were built without permits or an approved zoning plan — hiding behind a façade of legality the reality that Palestinians have virtually no access to either, and that what is illegal is the Israeli occupation of their land. Since it occupied East Jerusalem and the West Bank in 1967, Israel has declared 347,000 acres of occupied territory — nearly a quarter of the West Bank — as state land. But 99.7 percent of the state land Israel has allocated for public use so far — some 167,000 acres — has gone toward the development of illegal Israeli settlements, the watchdog group Peace Now recently learned through a public records request. A meager 0.24 percent of that land was allocated to Palestinians. After the Oslo Agreements, in the 1990s, the West Bank was divided into Areas A and B, which are under the limited control of the Palestinian Authority, and Area C, under exclusive Israeli military control. While the arrangement was supposed to be temporary, Israel has effectively treated Area C as its expansion grounds — and some 400,000 Israelis live in illegal settlements there, protected by the military. With Palestinian chances of obtaining building permits in Area C “slim to none,” according to analysis by B’Tselem, most have given up on the process altogether. Palestinian Bedouin men sit together in Khan al-Ahmar on July 26, 2018. 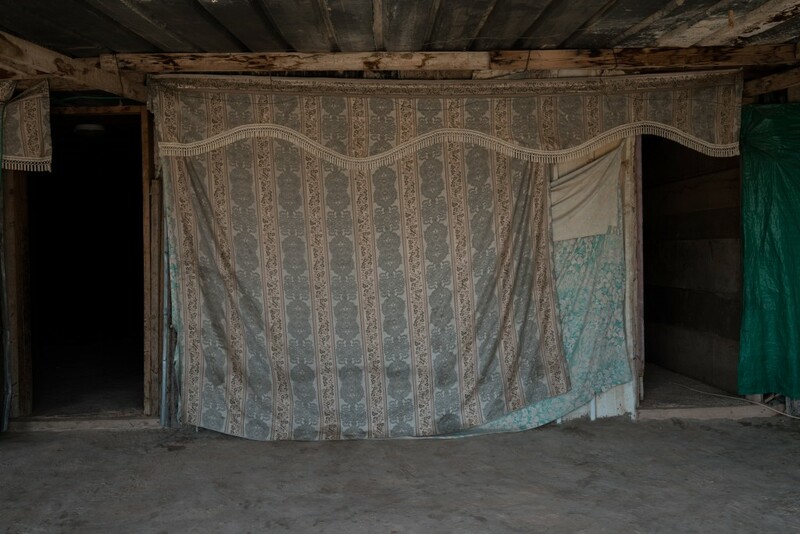 Rayyah spoke to The Intercept from her home — three shacks of tin, tarps, and scrap wood she shares with her large family. Like many Palestinians in Area C, Khan al-Ahmar residents are not allowed to put up new structures or bring in construction material, so when Rayyah’s sons got married or new children were born, everyone squeezed into the structures they had already built, even though they, too, are subject to demolition. “If I put something up, they’ll come and destroy it,” she said, adding that a drone flies over the village every day, photographing anything new that residents may have built. 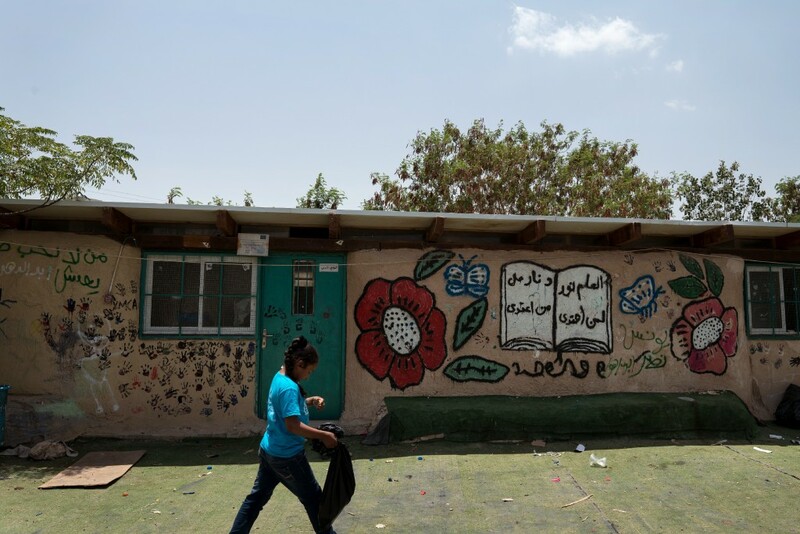 Israeli authorities have destroyed or confiscated at least 12 Palestinian school buildings since 2016, and 44 Palestinian schools, including Khan al-Ahmar’s, are currently at risk of demolition, Human Rights Watch found. Over a third of Palestinians living in Area C don’t have access to primary schools and are not allowed by Israeli authorities to build any — leaving 10,000 children to attend schools in tents or other temporary structures with no heat or air conditioning. But the mud walls of the school in Khan al-Ahmar — a sign of permanence — bothered neighboring settlers, and shortly after it was built, representatives of Kfar Adumim and the pro-settlement group Regavim petitioned Israel’s Supreme Court to enforce earlier demolition orders against the village. As the Supreme Court first upheld and then froze authorization to demolish Khan al-Ahmar, life in the small community carried on between hope and fear, while delegations of activists and Palestinian and foreign officials made trips to visit. Eid Abu Khamis, center, speaks during a press conference in Khan al-Ahmar on July 26, 2018. To Rayyah, talk of a Palestinian state in the West Bank seems far removed from the reality at hand — the only home she has ever known slated for demolition, and her 24 grandchildren facing displacement. Top photo: Rayyah washes dishes at her home in the village of Khan al-Ahmar on July 26, 2018.